This rustic Christmas stocking features a flannel like cuff with intricate stitch-work on the body. Santa has a overly exaggerated beard which just makes him look all the more holly jolly, not to mention His bag is full of presents for the good boys and girls! We do have matching sets for these specific stockings so that you can mix and match your collection! 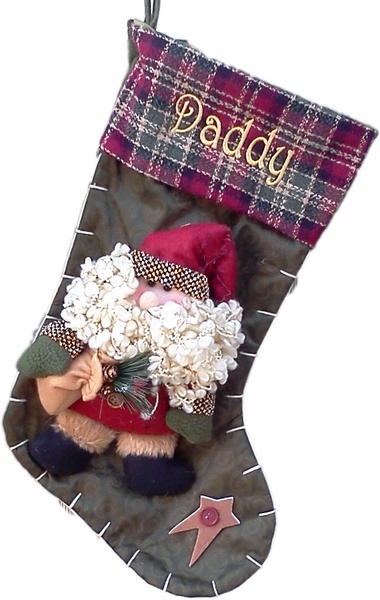 Materials: The stocking is made from green fleece and felt. It has intricate stitch-work along the stocking and a flannel pattern cuff. It has a "3d" Santa on it that is made of cotton with his bag of goodies. Lining: YES. Stocking is lined with Satin on one side and felt on the other.